Riding A Camel Through the Desert — in North America! I’ve always imagined traveling to an exotic destination in some spicy, foreign corner of the world where people ride camels across the desert and speak in tongues I can’t understand. I wasn’t sure where I’d have to go to get there. I never imagined it could be as easy as going to Cabo San Lucas, Mexico. Who knew? 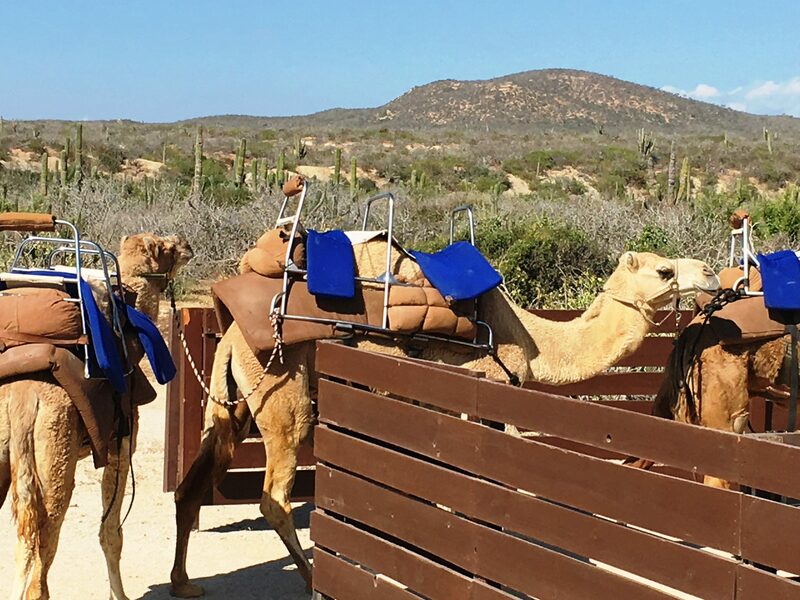 One look at the Outback & Camel Tour offered by Cabo Adventures, and I knew I had to make that long-ago travel fantasy come true. TransCabo was kind enough to find a spot for me on a Sunday afternoon trek. 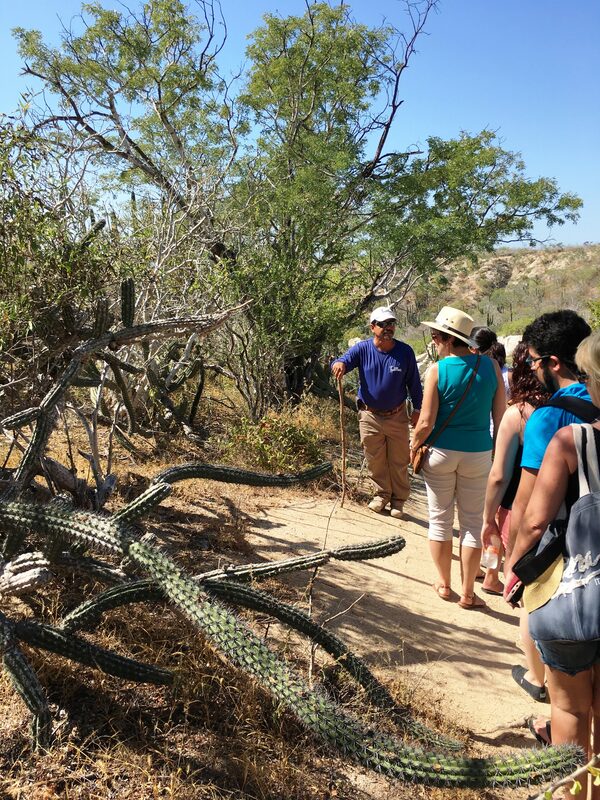 (The cruise ships dock in Cabo on Sunday, so be forewarned that tours book up.) I was taken to a dirt road 15 minutes outside the busy tourist area and wondered whether they’d misunderstood me. The only sign marking our arrival was for a turtle sanctuary. But since the signs were written in that elusive “tongue I can’t understand” (a.k.a Spanish), I trusted that the driver knew where we were going. Soon, the bus from the cruise dock arrived and our group was divided into Spanish-speaking or English-speaking. Then we climbed aboard a yellow jeep and our very charismatic tour guide Chicas explained the adventure we’d enjoy that afternoon. First a quick nature hike where he explained the flora & fauna. Then onto the camel stables which were located near the sea turtle sanctuary, which explained the sign I’d seen. It was a little strange to be guided by people we couldn’t actually see. It was technically true. 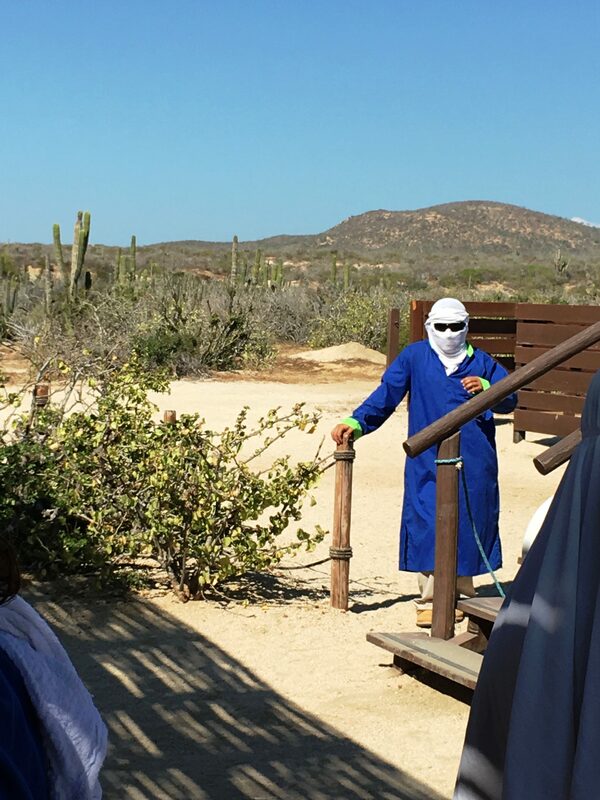 We were in a desert area of Baja California Sur. 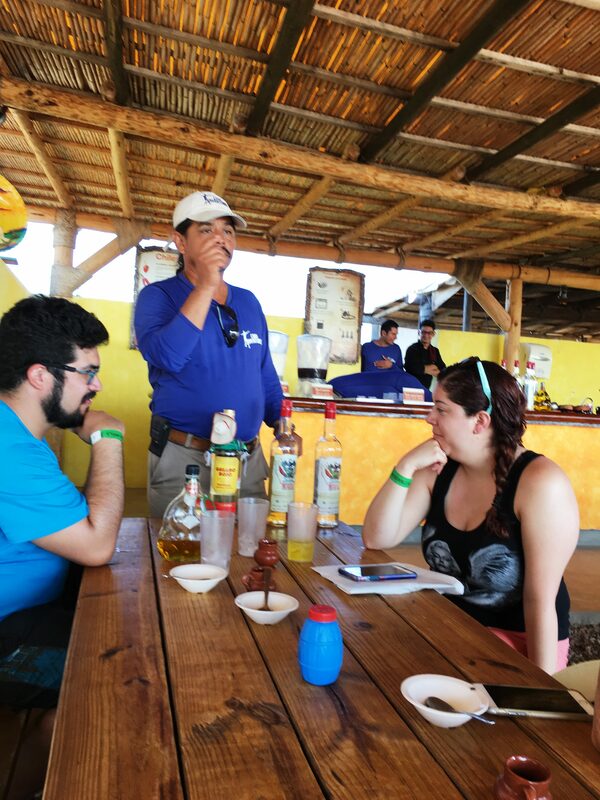 And as soon as we finished riding the camels, we’d be treated to an authentic Mexican lunch in their cantina before we finished with a tequila tasting. 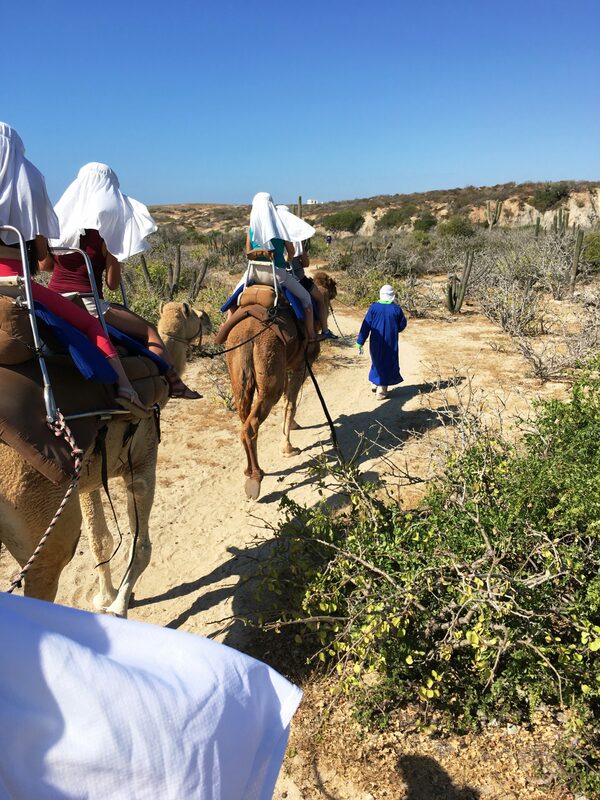 So, I was living out the fantasy: riding a camel through the desert in a spicy, foreign corner of the world where people spoke in tongues I couldn’t understand. I’d imagined Egypt or Morroco, but Mexico was so much closer to home. Chicas was happy to pour us as many tastes as it took to make our informed decisions. Lunch was delicious! I love mole sauce. We had chicken mole, rice, tortillas, chips & tomatilla salsa, and then three different kinds of tequila that we had to try again and again so that we could vote on our favorite. I’ll say this: our favorite tequilas didn’t have a worm at the bottom of the bottle. 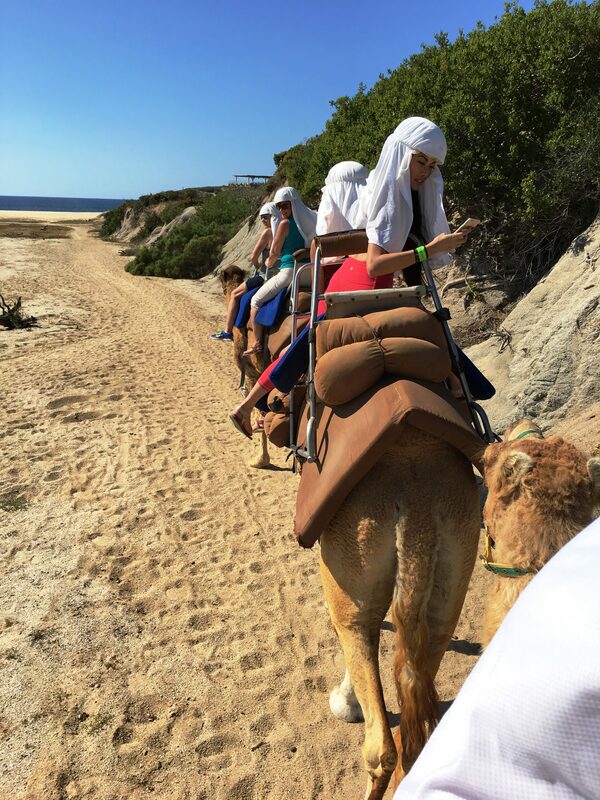 The Outback & Camel Safari is one of Cabo’s most popular tourist attractions. I can easily understand why. It’s a relaxing way to spend an afternoon on a stretch of Pacific beach that’s only population is sea turtles and camels. Are you partial to riding any particular type of animal? ← A Whale of an Adventure! I’d love to ride a mechanical bull. That’s as close to a bronco as I’m likely to get.